March 2019 | TOMMY JOHNSON, Jr.
A couple of big explosions won’t keep crew chief John Collins and the Make-A-Wish Funny Car team from going for the Wally at the 50th running of the Amalie Motor Oil NHRA Gatornationals. Tommy Johnson Jr. endured a Magic Dry Organic Absorbent NHRA Arizona Nationals he probably wants to forget. His Make-A-Wish Dodge Charger//SRT Hellcat Funny Car blew up twice during eliminations (although once resulting in a round win) and that means a lot of work for the Brownsburg, Ind.-based crew. Thankfully, the work comes with a little extra cushion because the 50th running of the Amalie Motor Oil NHRA Gatornationals is scheduled for two weeks after the Arizona Nationals. Granted, there are few events on the schedule more prestigious than the Gators. Johnson is looking for his first-ever win in Gainesville and enters the weekend as the second-ranked Funny Car driver in Power Rankings. He’s also fourth in the points, just behind teammates Jack Beckman and Matt Hagan. Robert Hight is the early-season leader. Johnson wrapped up 2018 with a great car, but failed to get to the winner’s circle after winning twice in 2017. His last win came at the 2017 Auto Club NHRA Finals in Pomona, the season-ending race. 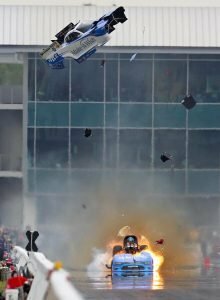 Indy Bureau Chief John Kernan caught up with crew chief John Collins to discuss what the rebuild process looks like after a very busy weekend in the desert.